"Tell Congress: Stop Police State Tyranny In America"
SILENCING THE PEOPLE. A Department of Homeland Security report entitled, "Rightwing Extremism: Current Economic and Political Climate Fueling Resurgence in Radicalization and Recruitment" warns of "radical" groups like Christian cults, pro-life groups and returning military veterans. Further, West Point's Combatting Terrorism Center claims that conservatives and libertarians are a threat to society in their report called “Challengers from the Sidelines: Understanding America’s Violent Far-Right.” At what point will law-abiding, pro-liberty Americans be labeled "terrorists?" DISARMING THE PEOPLE. On January 16, 2013 Barack Obama issued 23 executive orders, including 3 presidential memoranda, calling for increased gun-control. Diane Feinstein, Frank Lautenberg, and other Congresspersons have also introduced legislation to ban weapons and magazines, establish sweeping background checks, and create a centralized gun-registration system. AMERICAN CONCENTRATION CAMPS. The National Emergency Centers Establishment Act, initiates the framework for mass-quarantine of American citizens. Congressman Alcee Hastings (D-Fl) reintroduced this bill in the 113th Congress on January 23; the bill is H.R. 390. This legislation calls for the creation of six national facilities for the concentration of civilian internees. Who are they planning to detain? STABILITY POLICE FORCE. 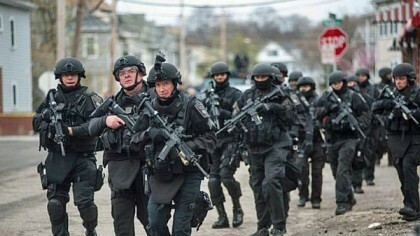 The George Soros-funded Rand Corporation issued a report calling for a Stability Police Force (SPF), saying "Stability operations have become an inescapable reality of U.S. foreign policy. Establishing security with soldiers and police is critical because it is difficult to achieve other objectives - such as rebuilding political and economic systems - without it." STATE-LEVEL MILITARY ACTIVITIES. Obama signed an executive order establishing a Council of Governors, which is to be a panel of 10 state governors selected by the President who will review "review matters involving the National Guard; homeland defense; civil support; and synchronization and integration of state and federal military activities in the United States," according to the White House. Has Obama now federalized the states and gained control of the National Guard? GOVERNMENT AMASSING WEAPONS. The Department of Homeland Security (DHS) has in its possession over 1.6 billion rounds of ammunition -- including hollow-points. The Department also has thousands of tanks for "domestic use," capable of withstanding "ballistic arms fire, mine blasts, IEDs, and other emerging threats." Why does the DHS need over a billion bullets, rifles, and tanks? We have the armed forces for our defense. INTERNATIONAL LAW ENFORCEMENT. Obama signed executive order 12425, giving the international police force INTERPOL immunity from American law. INTERPOL now has free reign in the United States, unencumbered by the Fourth Amendment, the Freedom of Information Act, American law enforcement agencies, and the U.S. Constitution. Obama has now given our sovereignty away to an international police force. DRONES IN OUR SKIES. In the summer of 2012, after legislation was passed and signed by President Obama, unmanned aerial vehicles were first dispatched into American skies. While these UAV's -- or drones -- are not armed, they are equipped with surveillance cameras. The records they collect are kept for 90 days. The government's encroachment of our rights will continue as long as we fail to act! Where will this dangerous pathway end? Take action to preserve liberty, the Republic, and individual sovereignty. Send your personalized messages to your Representative and U.S. Senators right now and ask them to DEFUND and DISMANTLE the American Police State! Bob E. from Tahlequah, OK signed. Christa S. from Davisville, WV signed. Someone from San Rafael, CA signed. Dana R. from Ogden, UT signed. Defund and dismantle the American Police State!! Gordon W. from Waynesville, NC signed. William D. from Mckeesport, PA signed. Kay Z. from Kershaw, SC signed. Kellie G. from Columbia, IL signed.